Sisi’s second presidential term will be challenged by Islamic extremism. The long-standing violence in Sinai is only one, albeit the most active, hotspot. Problems are worsening in Lower Egypt, too, as a result of the marginalisation of the Muslim Brotherhood in 2013. It is not certain, however, that the Egyptian government will be as successful in combating such militancy as it was in the 1990s in dealing with the Gami’at Islamiyya. On February 9th, the Egyptian army spokesman announced that the army and the police in Sinai had launched a major anti-terrorism campaign, just over one month before the presidential elections, which are expected to confirm Abdelfattah Sisi as Egypt’s president for a further four-year term, are due to start. The campaign had been long expected; in the immediate aftermath of the Al-Rawdah mosque massacre in which Da’ish in North Sinai (Wilayat Sinai) had slaughtered 309 people at the end of November last, the president had ordered the elimination of the terrorist organisation there within three months. The operation is now also a pre-emptive strike against Wilayat Sinai because of fears that it and other extremist groups had planned a series of attacks across Egypt to disrupt the electoral process which is set to begin in mid-March. The campaign promises to be a very bloody affair; hospitals in the Sinai region have been warned to keep one third of their beds free for the wounded and hospital staff have been put on maximum alert. 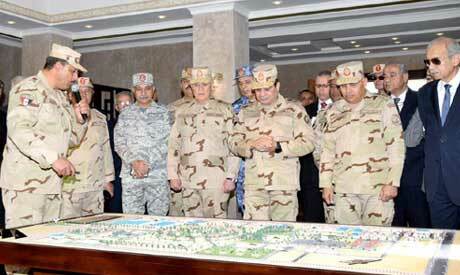 Schools are to be closed during the army’s operations and North Sinai is to be cut off from the rest of Egypt too. The operation will be massive in scope; whether it will be successful is another matter and some Egyptian commentators are questioning both its purpose and timing. If the operation is successful, it will certainly boost Mr Sisi’s electoral popularity and it will eliminate a threat to the state that has persisted in Sinai for at least the past decade and a half. Despite the doubters, its advent has certainly been greeted with enthusiasm. Organised terrorist violence in Sinai conventionally began with the bombings of a major tourist hotel and a camping site in October 2004 in Taba, on the border with Israel in which 34 people died and 159 were injured. In July 2005, an extremist group, Tawhid wa’l-Jihad, which claimed affiliation with al-Qa’ida, exploded bombs in two hotels and in the market at Sharm el-Sheikh, killing 88 tourists and injuring more than 200 and in April 2006, three bombs in Dahab, another Sinai resort, killed 23 people and injured 80 more. Although the violence died down in the next four years, it was to move away from the tourist resorts in the South, only to re-emerge in North Sinai targeting the gas pipeline between Israel and Egypt in February 2011 and firing rockets into Israel. Then, in mid-August of that year, Ansar Bayt Maqdis, as it now renamed itself, capitalising on the unrest throughout Egypt after the fall of President Mubarak and on the low level of security forces in Sinai as part of the 1978 Camp David Accords, sent a commando across the border to kill eight Israeli soldiers. In the ensuing chase, Israeli forces inadvertently killed five Egyptian policemen at the border, nearly causing a major diplomatic disruption. Since then, the tempo of violence has steadily increased, particularly after the army-based coup against the Morsi presidency in July 2013. The movement also spread into the rest of Egypt, with bombings and attempted assassinations in late 2013 and 2014 in Cairo, including an unsuccessful attempt to kill the interior minister in 2013, and at Mansoura in the Delta, where it destroyed the police headquarters, although its primary arena remained North Sinai. It did claim, however, at the end of October 2015, to have shot down a Russian tourist charter, killing all 224 people on board, although the Russian authorities later stated that a bomb had been placed aboad the aircraft at Sharm el-Sheikh. In early November 2014, the movement switched its allegiance away from al-Qa’ida, declaring its affiliation to Da’ish and renaming itself Wilayat Sinai instead. It also became even more egregiously violent, aping Da’ish itself in Syria and Iraq and continuing to terrorise Northern Sinai. Copts living there were forced out, hostile tribal leaders were assassinated and military and police outposts repeatedly targeted. Now, it appears that official patience has run out, although it is by no means certain that the army will prevail, given its clumsy counter-terrorism tactics (which alienate civilians rather than disrupting terrorists) and despite clandestine Israeli help (over one hundred covert air raids in Sinai are alleged to have taken place in recent years and Israel has agreed to allow the Camp David troop limits to be exceeded by up to five time the permitted number in order to ensure security). One reason for the persistence of the movement, too, is its complex local roots, despite the antagonism it has generated because of its violence against the local population. It originated amongst the Bedouin tribes of Southern and Central Sinai where, in the 1990s, much resentment was caused by their relative marginalisation as tourism developed in the south and urban development in the north of the territory. The measures taken to control the resulting violence in South Sinai forced the groups involved northwards during the last decade into the governorates of El-Arish, Rafah and Sheikh Zuweid, as well as into the natural shelter of the cave complexes in Jabal Hillal. Some of the tribes, too, had long had links to radical jihadi groups in the Gaza Strip with whom they maintained links through the tunnel complexes that linked it with Northern Sinai and which generated significant financial benefits for their operators as they became integrated into the Gazan economy towards the end of the last decade. By the start of the new century, too, this local dissident community had been augmented by returning jihadis from Afghanistan dedicated to attacking the Egyptian state, including, as it became more prominent after 2011, the Muslim Brotherhood which they regarded as apostate and subsequently, of course, the new military-based regime after 2013. Sinai, however, is not the only arena for the current military operations, as Al-Akhbar, the Lebanese daily, has made clear. There will also apparently be operations in the Western Desert, no doubt as part of Egypt’s determination to seal its borders with Libya to prevent any spill-over from extremist violence in centres such as Derna on the Cyrenaican coast. Indeed, Libyan sources have recently claimed that Egypt will now take an active role in supporting self-styled Field Marshall Khalifa Haftar’s Libyan National Army as it prepares to attack Derna to eradicate the extremist groups there. The Speaker of the Tobruk-based parliament, Aguila Saleh, made this clear in an interview with a website based in Egypt on February 12, 2018, just four days after operations began inside Egypt itself. He also hinted that both sets of operations were linked, thus underlining the depth of Egyptian concerns about the situation across its western borders. This raises the question of the wider purview of violence against the Egyptian state and the role it has played in destabilising the military regime. Of course, for the regime itself, all such localised violence within the rest of Egypt outside Sinai is simply a product of its successful repression of the Ikhwan Muslimun which it regards as a terrorist organisation. In the United States, conservative opinion justifies this view by pointing towards the regressive influence, as it sees it, of al-Azhar, Egypt’s mosque-university, generally regarded as the yardstick of Sunni orthodoxy. Matters are not quite so simple for, although there are radical elements in the movement that now no longer believe in its agenda of pacific engagement with state authority, the core movement itself and its hierarchy still insist that they will not encompass violence in their search to restore democratic governance. Yet, over the past four years, violent movements have emerged, apart from the Wilayat Sinai, which are linked to Ikhwan and which have developed a new strand of extremist justification, ‘Ikhwani Jihadism’, akin to the activism of Hamas in the Gaza Strip. These movements have evolved slowly from relatively spontaneous and localised origins in three stages, coalescing in the second stage between 2014 and 2016 into coherent armed groups such as the ‘Popular Resistance Movement’ and ‘Revolutionary Punishment’. Over the last year these groups have further evolved into yet more sophisticated movements, of which two are particularly important; Hassm (Harakat Sawa’id Misr; ‘Decisiveness’) and Liwa ath-Thawra (‘The Revolutionary Brigade’). Both engage in ambushes, targeted assassinations and in improvised explosive devices although neither uses suicide bombers. Amongst their targets has been the former mufti, Ali Gomaa, a popular figure and supporter of the regime. Otherwise, state functionaries and the police have been repeatedly hit for the movements concerned do not engage in indiscriminate attacks upon civilians. Their attacks range widely throughout Lower Egypt and, up to mid-2017, they had been responsible for 174 incidents during the previous year. What is probably more disturbing for the regime, however, is that they attract ever-wider support amongst youth and that, given their urban-based location, they will be far more difficult to eradicate than Wilayat Sinai. It seems, in short, that President Sisi will be well-set for a lively and increasingly repressive second term as his regime seeks success in its combat with its violent opponents.